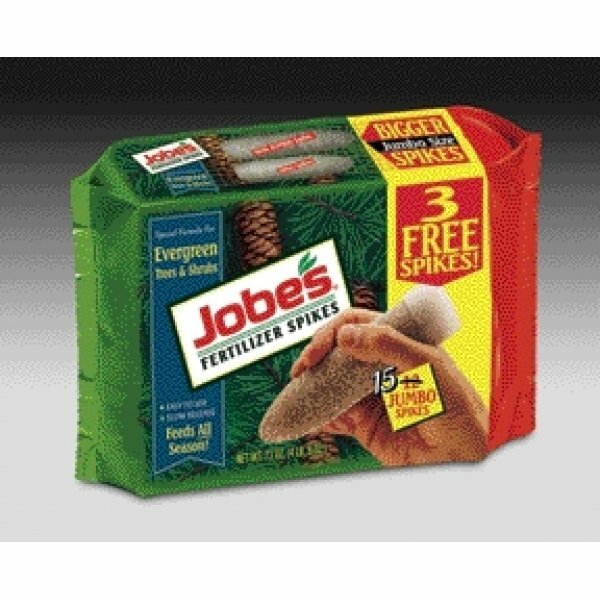 Jobes Tree Fertilizer Spikes has different options and/or variations, please choose below. Perfect nutrition for fruit, nut and evergreen trees and shrubs. It's no secret that trees and shrubs need nutrients. Healthy, disease free, and neatly shaped, trees and evergreens make your yard look spectacular. Jobe's Fertilizer Spikes ensure a continuous supply of nutrients below the surface, where the active roots are growing. Jobe's Spikes are easy to insert around the tree's dripline and last up to three months. No wasteful runoff, no mess, hazards or smells—only a safe, beautiful yard. 15 pack. Fruit, Citrus and Nut Spikes are specially formulated for fruit, citrus and nut trees. For best results, use Jobe’s Fertilizer Spikes for Fruit & Citrus Trees in early spring and late fall. Evergreen Spikes are specially formulated for acid-loving Evergreen trees and shrubs. For best results, use Jobe’s Fertilizer Spikes for Trees & Shrubs in early spring and late fall.